Are you ready for a card counting adventure in an immersive virtual world with Blackjack Silver? This version of Blackjack is developed by the leading live casino game company, Evolution Gaming and brought to you through bCasino. Evolution Gaming has earned a reputation for delivering a fresh breath of air in the gaming industry. Their games are characterized by excellent features, eye-catching graphics, and are fully optimized to be played across different platforms like smartphones, desktops, and tablets. The high definition cameras equipped in the studios place you in an atmosphere of a real Macau casino! You will meet friendly and skilled dealers who you can chat with as you proceed with your gaming. bCasino may not be a familiar name to some people because it is merely a year old in the iGaming industry. Nonetheless, the operator has partnered with some of the best software developing companies who supply them with a wide range of casino games and solutions. The website is operated by GS Technology Ltd company and licensed by the UK Gambling Commission (UKGC). One of the things that attract many UK-based players to this website despite being new is the rich live casino game portfolio. The games are primarily powered by Evolution Gaming, and they come with all the necessary tools to give you the thrill of a real casino. You will receive a warm welcome with a generous bonus offer up to $1200 Bonus plus 100 free spins. Besides, the casino has a qualified customer support team to offer help to players at any time via live chat, email, and telephone. Blackjack Silver is a perfect variant of the classic blackjack and uses the standard rules of playing card games. The objective of the game is to make a hand close to 21 but to exceed it. Before playing, you need to select the size of your chip value which ranges between $50 to $5000. Clicking on the 'Free Bet position' will enable you to stake your bet. 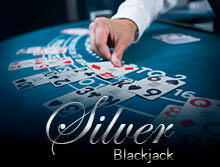 The minimum and maximum bets in Blackjack Silver vary from $10 to $2000. Each table has seven seats in this variant. In case you miss a position in the game, there is a 'Bet Behind' feature which is designed to help bet on a hand that has been dealt with another player. The player and dealer each get two cards and can choose to Stand, Hit, or Split, depending on the hand. The card values in this version are similar to the standard to a standard blackjack. Like mentioned before, Blackjack Silver applies the classic blackjack rules, 21+3 as well as perfect pairs bets. Although these features are optional, they will help you to maximize your chances of winning. With this feature, you can win if your first two cards have pairs such as two Queens or two Aces. There are three types of pairs in Blackjack Silver. Hit: The dealer is allowed to Hit when he has a hand value of 16 or less and can take an extra card. Stand: The dealer can Stand when the hand value is 17 or higher. Bust: The dealer loses the round or busts if the hand value is more than 21. Double Down: If the total value of your first two cards is 9, 10, or 11, and the third value aids you in beating the dealer, clicking on the Double Down feature will double your bet, and you will receive an additional card. Split: If the first two cards you are dealt have the same value, you will need to Split them into two separate hands, but you cannot double down your bet. Evolution Gaming Blackjack Silver has fast-paced gameplay, sleek, and with lots of features like side bets, bet behind, and many others. Everything in the game is fully optimized to fit on different gaming platforms like mobile phones, tablets, and desktop computers. The Direct Game Launch feature will allow players access the game directly from the operator's advertisements through the web or emails. It has a wide range of features like the side bet and perfect pairs. The vast game collection of top live games by Evolution Gaming at bCasino will leave you perplexed. This leading UK-based casino site is packed with everything you may need in a casino. The list of live blackjack variants offered by the operator includes Blackjack VIP, Grand VIP Blackjack, and Diamond VIP. Other than the live dealer games, you will find other popular variants like Baccarat, Roulette, and Poker. All new players are entitled to a generous welcome bonus among other promotional offers. You will be served by professional support agents via email, live chat, and telephone 24 hours 7 days.